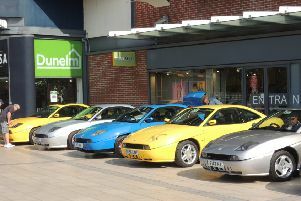 Supercars made a grand and noisy entrance into Horsham this morning (Easter Monday) as part of the final day of Piazza Italia. Fiats and scooters had already made their entrance earlier. Bumper crowds then had a close up view of several powerful cars as they made their way into town. The vehicles are on display until later this afternoon, while other attractions include fashion shows, street entertainment, Italian Market and various activities for children.